Thanks for posting the Lesson! 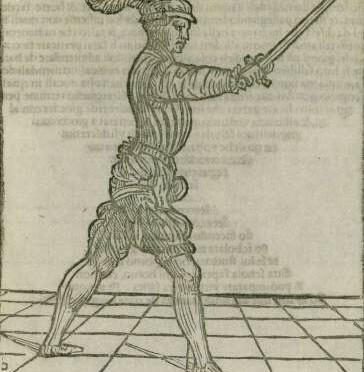 I’m curious about the Parry standing in Guardia di Testa: do we have to parry a Mandritto by putting DOWN the tip of the sword?, while to parry a Roverso you have to put UP the tip of the sword? 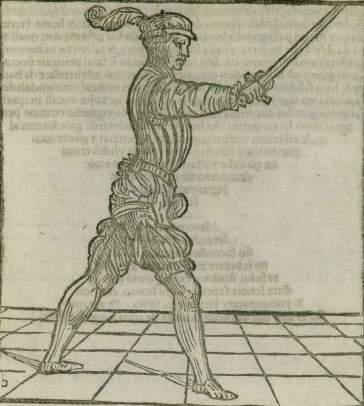 I’m trying to understand if you can parry – in Guardia di Testa – Mandritto and Roverso blow just by rotate your body – without change the alignment of the sword – or not. The point stays up in Guardia di Testa according to Manciolino. What we are doing is orientating the direction of our ground path towards the incoming blow. So rather than thinking about us only facing the opponent in Guardia di Testa, think of it more as we face towards the incoming blow to catch it on our sword’s medole or forte. So for mandritto we turn to face the sword on our inside line, the fendente we face forwards, and the riverso we face towards the outside line. The turning action is done by turning the torso and some pivoting of the feet. Alfieri described a similar concept in his spadone manual when he talked about moving with the vita in Chapter 17 to power the serpentine cut.